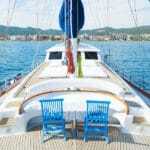 Gulet cruising is an exciting way to clear your mind while on holidays in the Mediterranean. Starting from the month of April to the end of October, travelers can book a gulet charter holiday in Turkey and enjoy the picturesque coastline it has to offer. 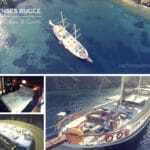 A very wide choice in gulet charter routes are offered for guests, to suit their interests. From family holiday itineraries to island hopping or nightlife style itineraries, there is much that you can decide from. It simply up to you in how you wish to utilize your well earned vacation at sea. Among the many choices, one favorite route is located in the Gulf of Hisaronu. Hisaronu is a small underdeveloped and peaceful village that is favored by locals in Marmaris and nearby towns for weekend get-a-ways. 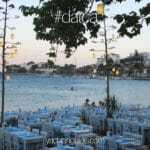 After the town of Datca, it is the 2nd most popular area for windsurfers due to its wide open bay. Hisaronu is also a regular anchorage point for daily boat trips from Marmaris harbor. So, obviously this itinerary begins from the spectacular city of Marmaris, Turkey. There is much to say about Marmaris itself. However we can continue along with this route and see what beautiful places this blue cruise will take us to. When we leave the harbor after the first night in Marmaris harbor, guests will wake up to a lovely Turkish breakfast on board their gulet charter. Shortly after their breakfast, their blue cruise itinerary could lead them to a possibility of a few bays near the harbor for a relaxing swim. 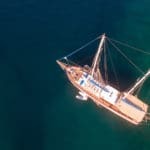 Either your gulet can travel to Cennet Island (Paradise Island) – a small island so small that if you blink you might miss it as its one of those hidden places great for private swimming and rarely found boat traffic if you are there early enough. Your boat charter could alternatively head to the wonderful resort town of Icmeler. A place filled with many lovely shops and a peaceful seaside with very lush green hilltops. Icmeler is quite well known for its very clean blue flag beaches and crystal clear waters and visitors have a choice of a either a sandy beach or pebbly. Both are quite pleasant. In summer is when Icmeler really reaches a peak volume of visitors – however it is still beautiful just the same. Moving along the coastline the next stop for a cooling swim and maybe some water sports fun is the bay of Kumlubuk. Although many daily boat tours make this lovely bay their stop, it is an under developed region for facilities. Therefore you can expect a lovely time here. A bit of swimming or snorkeling, banana boat ride or other water activity will offer plenty of fun and then a peaceful lay down on the sun mats on deck with a cold cold drink could end the time nicely in Kumlubuk. You might even have a tasty lunch while there. Kumlubuk is a part of the town Turunc, so just before you reach Kumlubuk, you may wish to have a visit in Turunc – another breathtaking place surrounded by very green hilltops of pine trees. Now past this point, you might like to not stop for a while until you reach the first village along the way. It is probably the most underdeveloped of all villages in the Marmaris region, but the area is amazingly beautiful. During this blue cruise time, a relaxing nap, taking some incredible scenic photos, or other pastimes might be on your agenda. So soaking up the Mediterranean sun is ideal while cruising and feeling the warm breeze. Sogut village offers the largest land mass of all villages. It is one of the most peaceful villages around. There is hardly next to no boat traffic, yet it is one of those must-visit places on the map. Not many people know about Sogut village, and that is probably why it stays so serene. Should you decide to go ashore, a walk up hill to see the panoramic views could be a delightfully pleasing idea! When you are on a Turkey gulet charter holiday, keep in mind that itineraries are flexible. As there are so many other places to drop anchor, you can speak to your captain and discuss where you wish to go and how long or short you wish to stay. Past Sogut village, on route you can have the opportunity to visit the other villages and other little bays in between. Villages such as Selimiye, Orhaniye, Turgut and Hisaronu are each beautifully different from each other. So the choice is yours as peaceful Turkey gulet charter holidays begin in the villages.